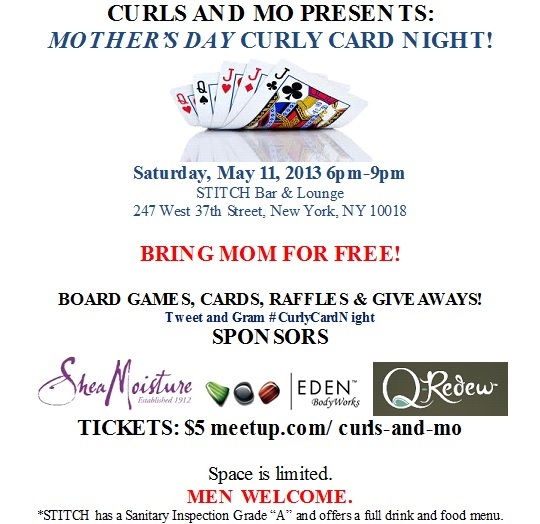 Curlistas, this Saturday is the May Curly Card Night. If you’ve ever attended one you’ve probably noticed the lady who wouldn’t leave my side and looks exactly like me (yes, she looks like me – lol). That’s my mom. She’s my biggest supporter and #1 fan. In honor of her and Mother’s Day this year, all moms play for FREE! When you purchase your ticket, simply email me mom’s name and she can come and join us. I hope to see you there!